L'Oreal: Buy 1, get 1 50% off on cosmetics with CVS card. Excludes Double Extend Keratin kit. Revitalift Deep-Set wrinkle day lotion,night cream 1.7 oz,Collagen or Age Perfect Pro-Calcium or ALL Skin Genesis are priced at $15.99 with CVS Card. Excludes Advanced Revitalift,Age Perfect Calcium and Collagen Moisture filler. 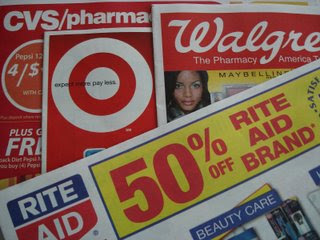 RoC: Save $3 on RoC products with CVS card. Excludes cleansers. Olay: Regenerist 1.7 oz is priced at 23.89. If you purchase an Olay product that retails over $20....you will receive a $5 Target gift card. No rain checks. Chapstick: Fresh Effect retails for $2.99. There is a single check rebate for $2.99.This deal requires you to sign up on riteiad.com/SCR or by mail. Nivea: Lippies retail for $2.99. The single check rebate is for $2.00. Sign up is required for the offer. Eucerin or Aquaphor: Save $3 on skin care products. Coupon in store circular. Sally Hansen: Gift sets are priced at 40% off.